I am growing increasingly concerned that the White House has been compromised and that President Trump is being prevented from carrying out his agenda. There have been some shocking developments coming out of the White House in the past week that has made me question who is in charge. The appointment of John Bolton is very troubling. He is a globalist warmonger and his presence can only mean one thing. He was brought in for the sole purpose of starting World War III. President Trump had seemed to be getting the Korean crisis under control. North Korea’s leader has blinked and said that he would agree to give up his nuclear weapons and seek reunification with South Korea. A summit was discussed by Trump presumably to be scheduled in May. Now, the talk of Trump led peace talks has disappeared from the President’s messages to the public. Kim is so frightened he secretly went to China after CFR mainstay Bolton entered the White House. Since Bolton came on the scene, we have sent massive amounts of troops into Jordan along with tanks and tactical nuclear weapons. America, we are on the verge of World War III. This is a complete reversal of where the President stood only two weeks ago. I have risked my life and the lives of my family to support this President. If the Deep State is ever successful in taking complete control of the reigns of government, through the Democratic Party, I will be on the first bus to a FEMA camp, or worse, as will many of my friends (eg Steve Quayle, Paul Martin, Mike Adams, Dr. Ted Broer). In supporting this President and opposing Hillary Clinton, I have cost myself employment, money and been subject to extreme criticism from some of my friends and family. Supporting Trump has turned many parts of my life upside down. How dare anyone question my resolve to Make America Great Again. I have been all in since the early days of the Trump campaign. I have been called a Russian subversive agent by the liberal media, namely, the New York Times and the Washington Post. 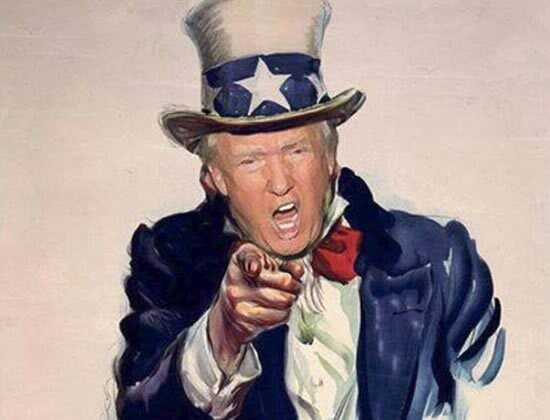 In supporting Trump, my reputation has taken enormous hits, but I am still standing with this President. For the record, Donald Trump is a flawed man who has fallen short of the glory of God, as we all have. I am shocked at how many Donald Trump zealots are patrolling social media. The slightest bit of criticism directed at Trump is met with vehemence and retribution. News flash: Donald Trump is not Jesus Christ and when he steps out of line, he opens himself up for criticism. In my role as a proud member of the Independent Media, I will never back off my responsiblity to tell the truth, no matter who is committing a transgression against humanity or the Lord. Donald Trump signed an Omnibus bill. I do not give a damn if he has discretion on how he spends the money, or not. I don’t give a damn if has some secret plan designed to fool the Deep State by signing the Omnibus. The fact remains that this President put his name on a document that supports baby killing and calls for the funding of Planned Parenthood to the tune of $500 million. A man’s word is his bond. and when he put his name on this abortion-supporting Omnibus bill, he crossed over to the dark side. I would like to ask a reflective question if I may. Are you aware of what a partial birth abortion can consist of? When the baby is exiting the birth canal, forceps are used by the executioner as they crush the skull of the baby. We don’t even execute mass murderers with such depraved indifference. The means does not justify the end. Following the execution of the baby, the baby is then carved up like some pinata and its body parts are sold to the highest bidder. Look at this practice America! Do not run from the facts that underlie the fact that this country has executed 60 million babies. Then read what the Bible says about harming children. Is the White House Down? Has there been a successful coup? What could account for such noteworthy reversals by President Trump? Regardless of where the truth lies, this President needs our prayers, but we, as his base, cannot be pulled off point. There are two underlying forces at work in making this country great again. The first principle is our dedication to reclaiming the Constitution in its original form. The second and the most important precept is our unwavering service to our Lord and Savior, Jesus Christ. On these points, there can be no compromise. Pray for Donald Trump and demand better from President Trump. Trump slipped “The Holman Clause” into the $1.3 Trillion Omnibus Bill he just signed. The Holman Clause gives the president the right to pay any federal employee $1/year! Trump can pay all the Deep State (SES people) $1.00/year and I doubt if they stay on!! !